Tap the blue Pages icon, then in the pages menu tap the + button to create a new post. Enter your page title (you can always change this by editing your page settings afterwards). You can also edit the following settings: allow comments, allow pingbacks, publish date, post status, visibility, post format and excerpt. The only information you need to add at this stage is the title. You can change any of these settings at a later date by selecting ‘edit page settings’. 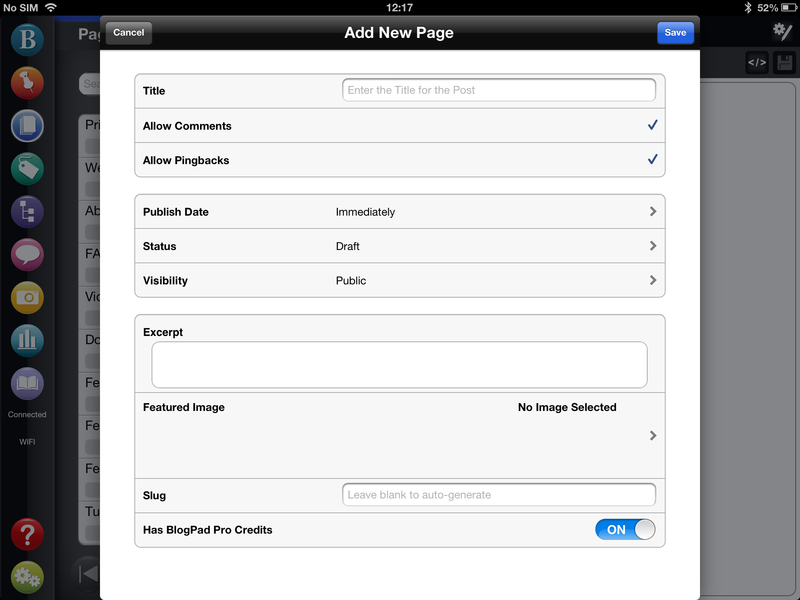 Tip: leave the page status as draft until you are ready to publish your page. 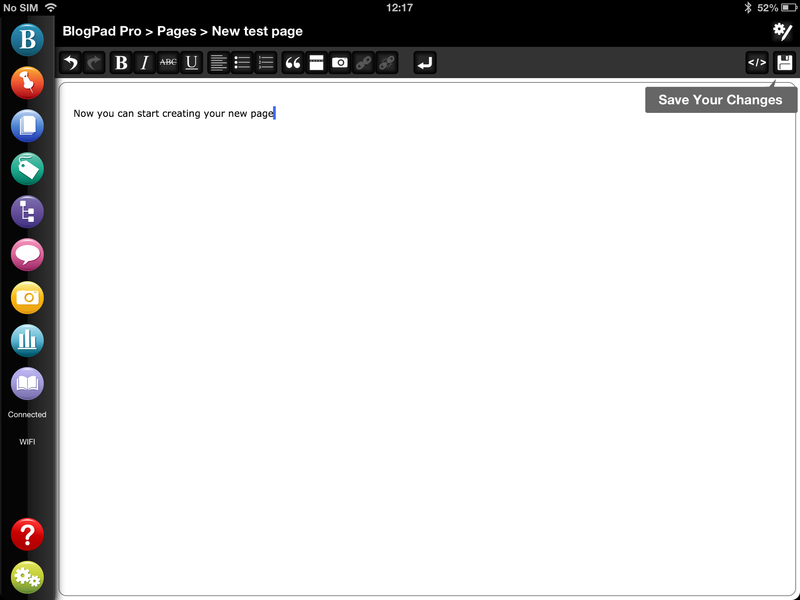 Once you have added your title tap Save to create your page. 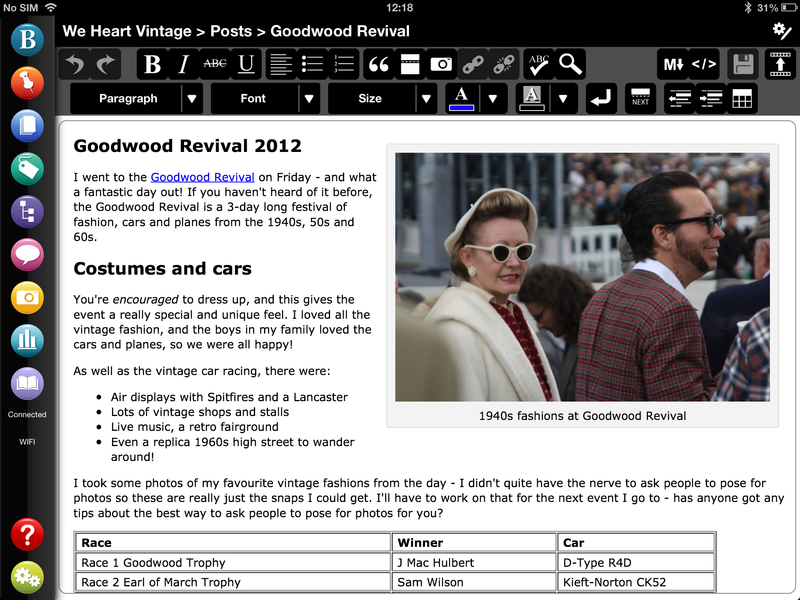 Once the page has been created the new page opens on your screen ready for you to start writing. 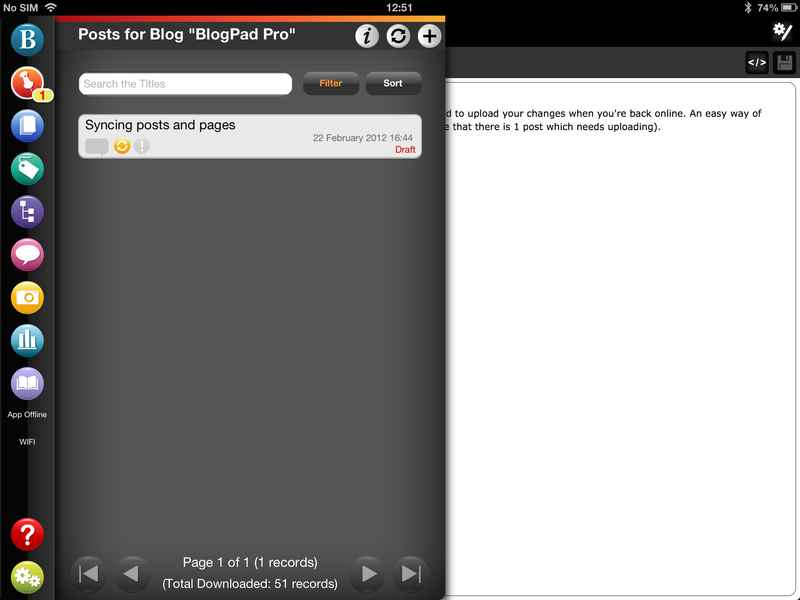 You can set BlogPad Pro to be ‘offline’, for example if you’re out and about and don’t want to use up too much data. To do this tap on the green ‘Settings’ button on the bottom left. The first option you see is ‘Set Application Offline’, change this to ON then tap ‘done’. 4. You’ll see a message like this telling you that you’re working offline. Just tap OK or ‘Don’t show again’ if you don’t want to see this message every time you save. 5. Now you can create your post as normal. Note the yellow notification badge in the menu next your Posts icon telling you that you have 1 post which needs uploading to live. 6. I have added some text and a picture from my iPad camera roll. Tap the save button (top right) to save your changes. This DOES NOT publish your post, it just saves your content (unless you’re working ONline and your post is already published, then the save button will update your live post). 7. Once your post is finished and you have saved. 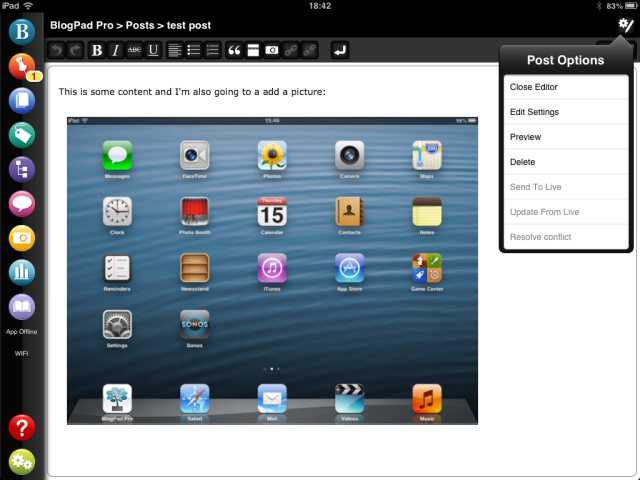 Go to post settings and tap ‘Close Editor’. 8. Once you get back online you can upload your post. 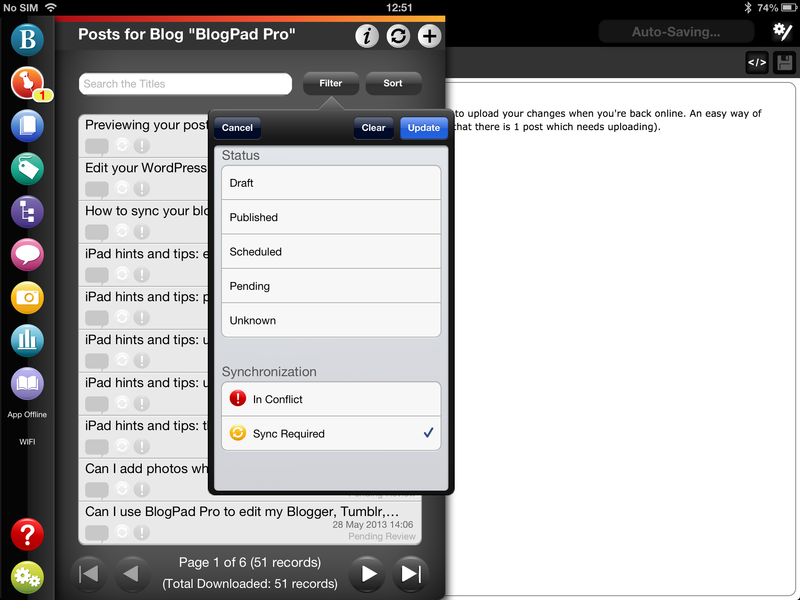 (If you changed your settings to “set BlogPad Pro to be ‘offline'” you’ll need to switch this bach OFF). The notification badge shows that I just have 1 post that I need to upload. To upload a single post tap on it, and in ‘Post Options’ select ‘Send To Live’. 9. If you have more than 1 post to upload tap on the ‘sync’ icon and within ‘Post Sync Options’ select the bottom option ‘Upload Posts To Live’. This should upload any changes or new posts along with any images in them. 10. You’ll know that your upload was successful when the yellow notification badge disappears, meaning your offline content has been uploaded. 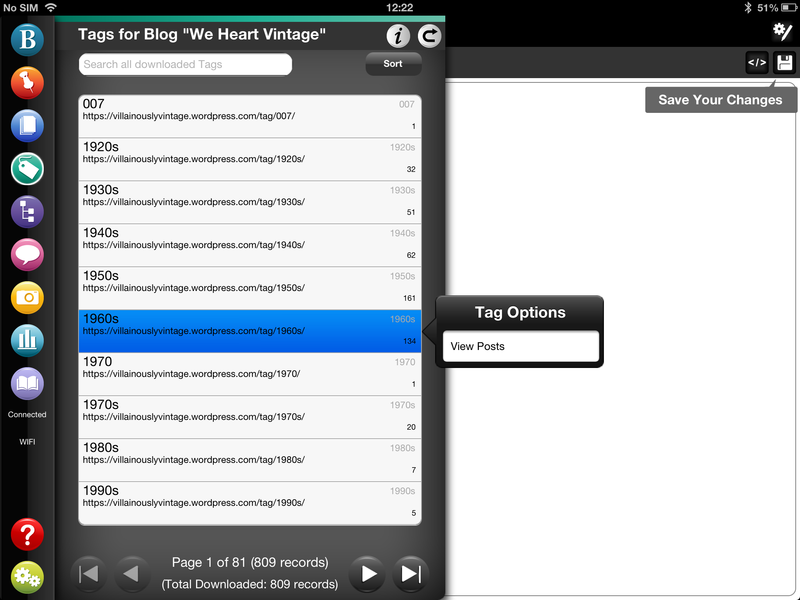 You can view all your tags by tapping on the green ‘Tags’ button in the left menu. If you have lots of tags on your site (and I think most people probably do) you might find it easier to search for tag you’re looking for in the search box. 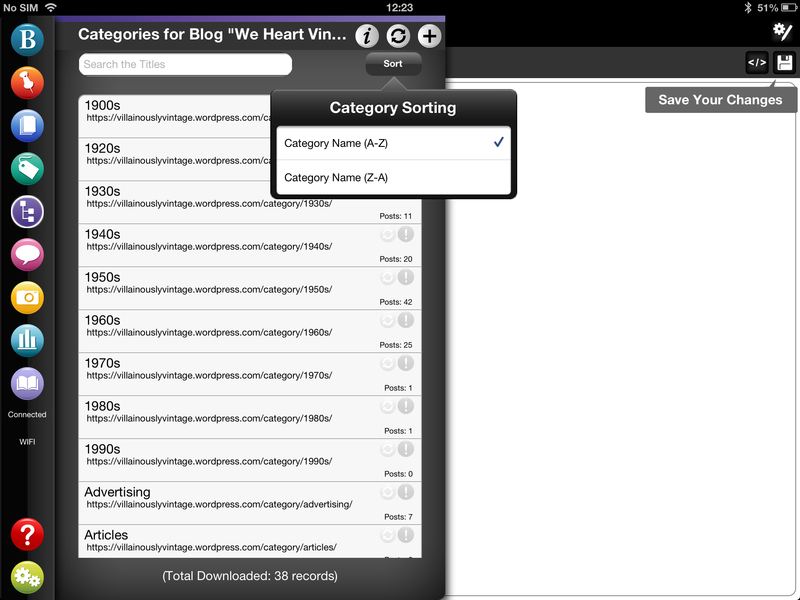 Another way of viewing your blog’s tags is by sorting them. You have the choice of sorting either by Number of Posts (Most First), Number of Posts (Least First), Tag Name (A-Z) or Tag Name (Z-A). 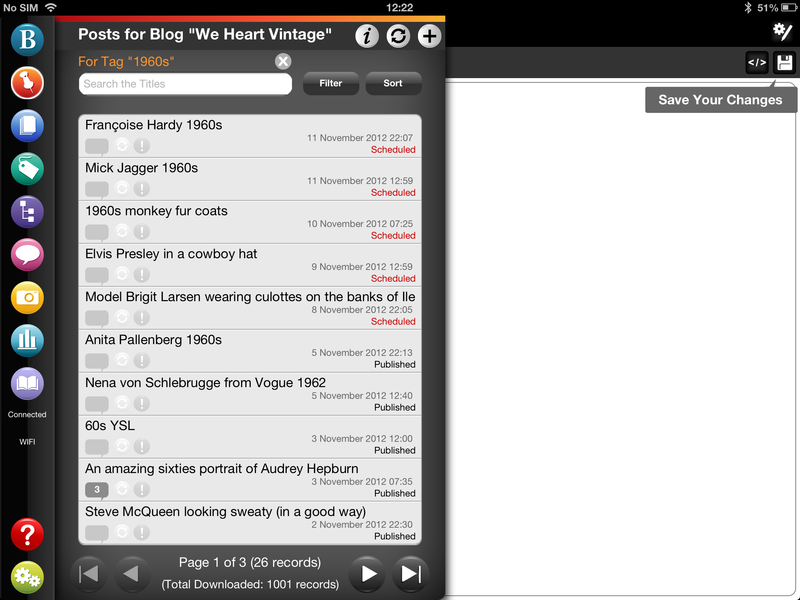 You can also view all posts related to a particular tag by tapping on the tag and the selecting ‘View Posts’. 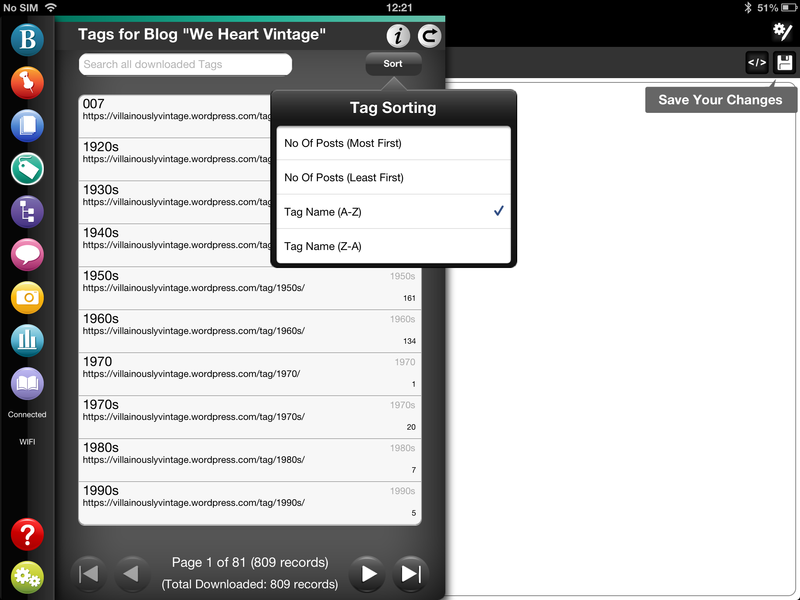 This takes you to the ‘Posts’ list filtered by the tag you selected. Just tap the ‘x’ to clear this selection and show all posts again. 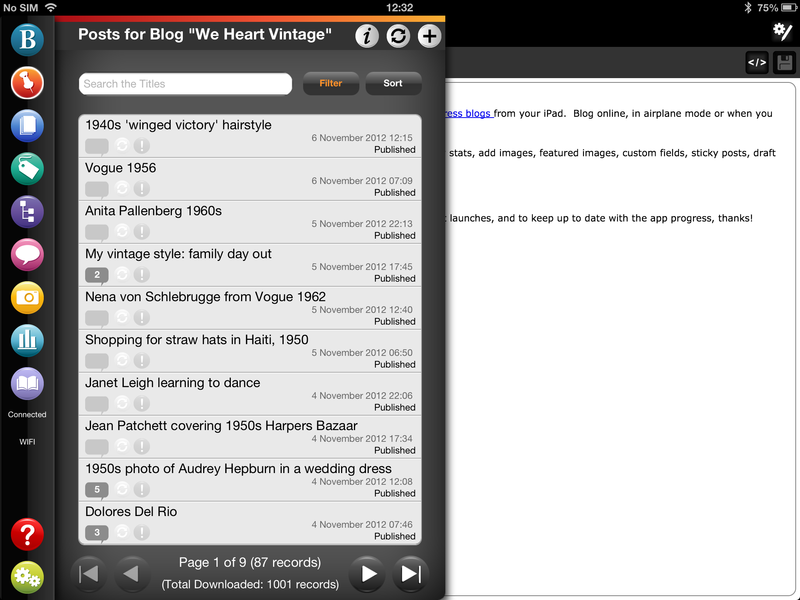 How to download your WordPress blog if you’re going to be working offline or in airplane mode. If you’re going on a plane journey or know you’re going to be blogging offline you might want to download part or all of your blog to give you access to your posts, pages, comments or image library while you’re offline. Downloading a post will automatically retrieve any images, tags or categories used in that post. Please note: If you want to have the full content of each page available offline make sure the ‘Only get Post Titles’ box is unchecked. Also, if you are downloading a large number of posts it could take some time and you may prefer to do this while you’re connected via a wireless network. 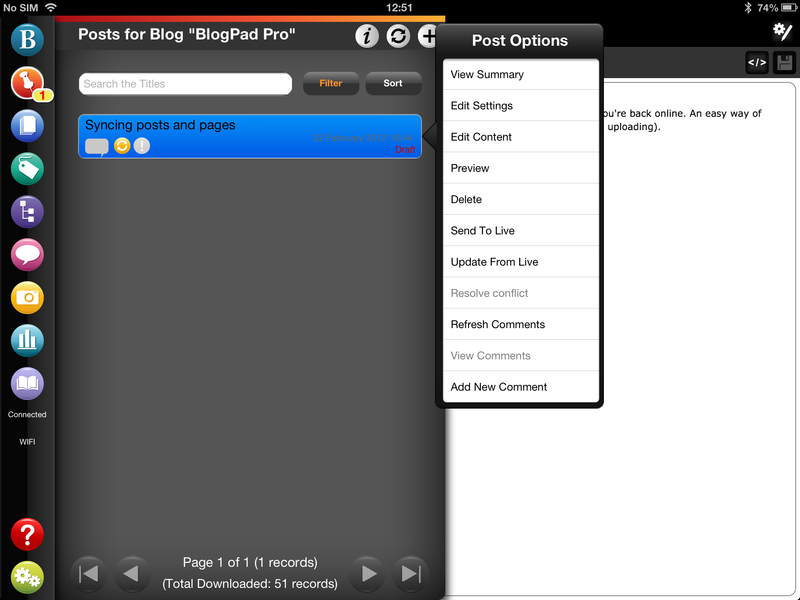 When you download posts and pages any media items used in them are automatically downloaded into the BlogPad Pro media library on your iPad. If you want to download more media items tap on the yellow Media icon in the left menu, tap ‘Media Sync Options’ and select the number of images or media you would like to download, then tap ‘Get Media’. If you are downloading a large number of media items you may prefer to do this while you’re connected via a wireless network. 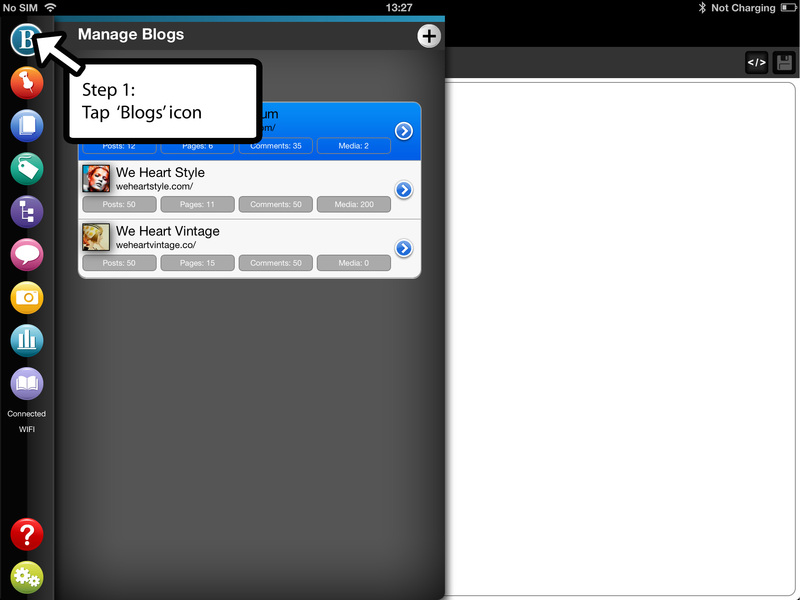 To download the latest comments or pingbacks/trackbacks to BlogPad Pro tap the pink ‘Comments‘ button in the left menu, tap ‘Comment Sync Options’ and select the number of comments you wish to retrieve. Then tap ‘Get Comments‘. 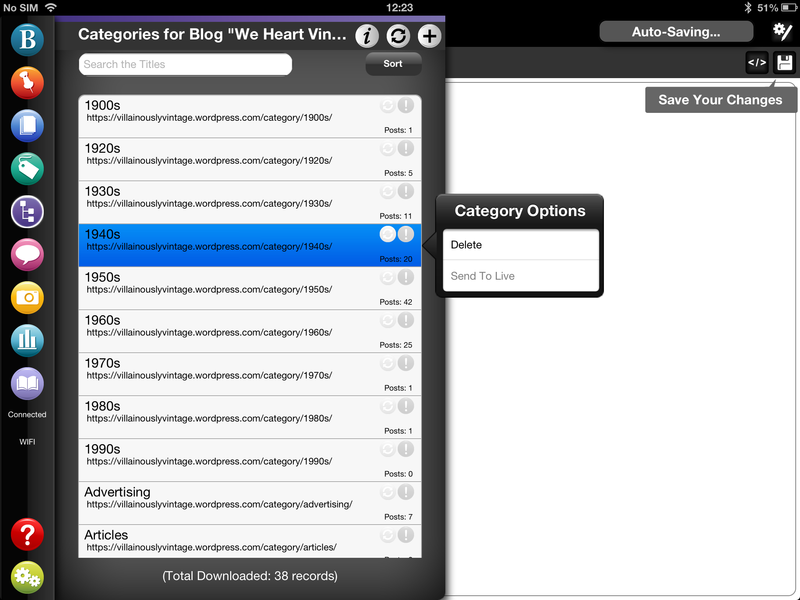 To see the categories on your WordPress blog tap the purple ‘Categories’ button in the left menu. You then see a list of the categories you have used. You can scroll through these, or search using the search box. You can also sort them by name, either A-Z or Z-A. If you have been working offline or without an internet connection you will need to upload your changes when you’re back online. An easy way of seeing this is the notification badge which shows in the left menu (you can see below that there is 1 post which needs uploading). This is the filtered list of posts which need syncing – there was only 1 post in this case. 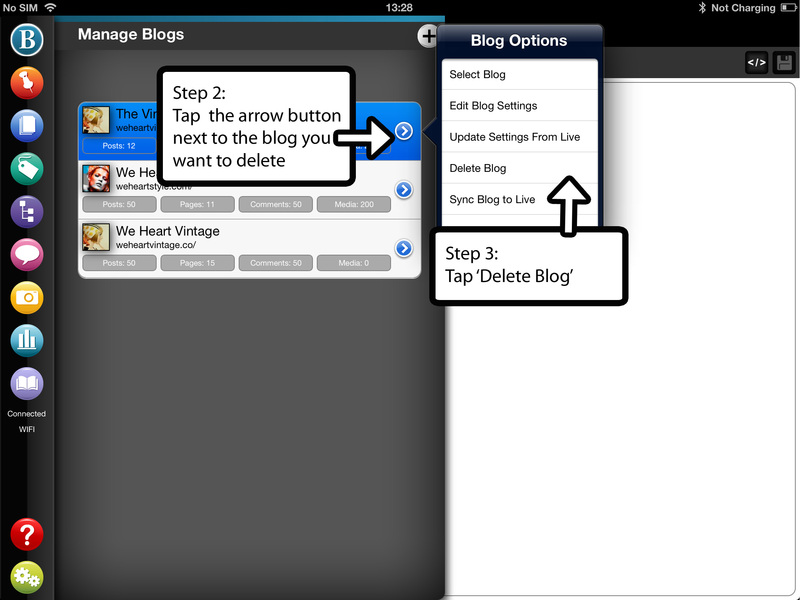 If you have more than 1 post to send to live tap the sync button > Post Sync Options then tap Upload Posts to Live. 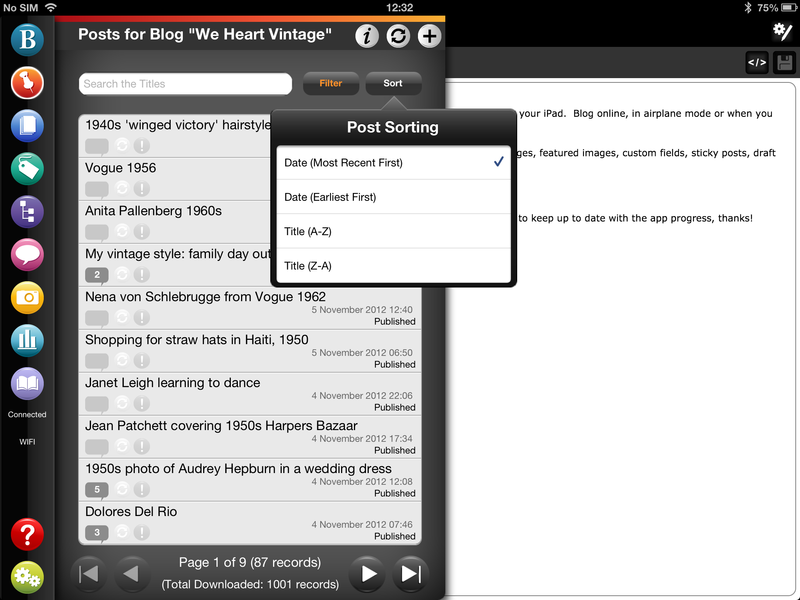 When you upload a post it will automatically upload any tags, categories and images related to that post. 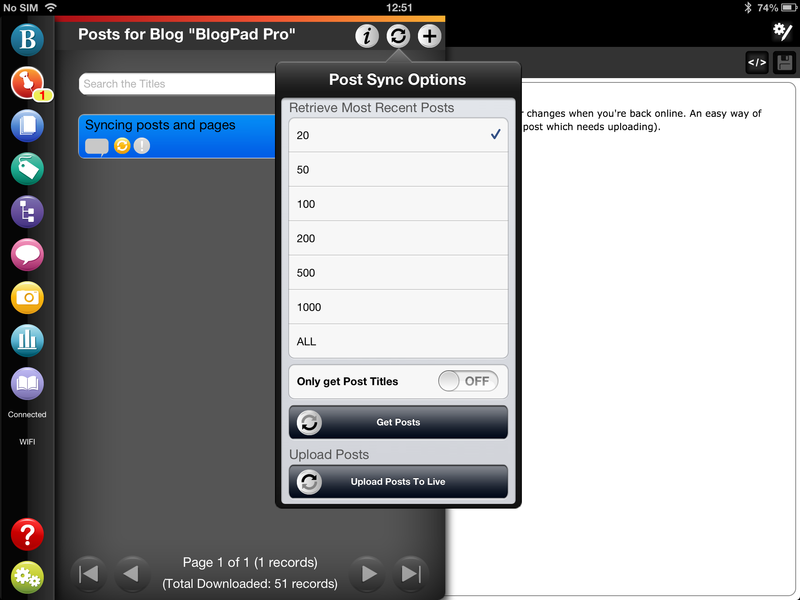 You can also sync your whole blog to live if you have made changes to comments, posts and pages. When you’ve been blogging for a while, it can be difficult to find that post or page you’re looking for. To make it easier, we’ve not only added a search (which searches the post or page titles) but also a filtering and sorting. So, what does Filter do? If you tap the Filter option, you can select which post statuses you would like to view. 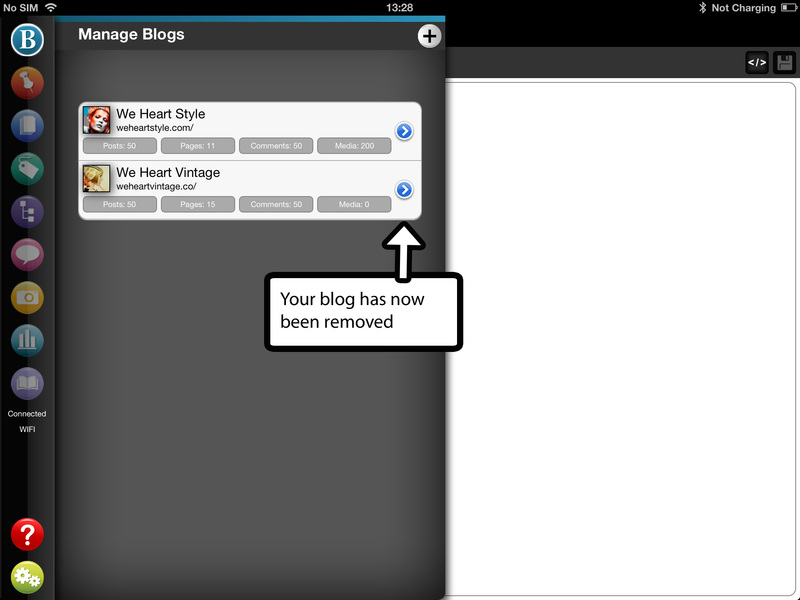 For example if you just want to view published posts select ‘Published’ and tap ‘Update’. Note: The ‘Unknown’ status is used when you have chosen to just download post titles. The post status isn’t retrieved as part of this. Now only published posts are shown in the list. To remove the filter tap ‘Clear’ and the ‘Update’. You can also select multiple statuses. Any of the searching, filtering or sorting options can be combined to make it easy for you to search through hundreds of posts or pages!